Oral care is about more than making your pets’ smiles sparkle—it’s an important component of their overall health. In fact, 80% of dogs and 70% of cats begin to show signs of oral disease by age 3. 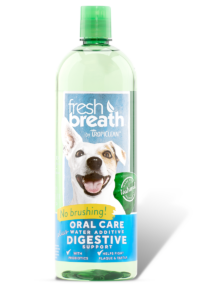 With Fresh Breath by TropiClean Oral Care Water Additive Plus Digestive Support for dogs can benefit from daily plaque and tartar defense, simply by drinking from their water bowl. Plus, probiotics support healthy digestion. 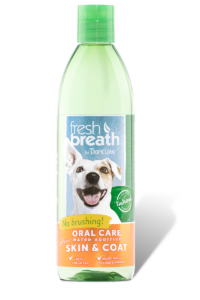 Easy to use for both you and your pet—no brushing required. Purified Water, Citric Acid, Cetylpyridinium Chloride, Chlorophyllin, Glycerin, Potassium Sorbate, Fructooligosacchride, Hemicellulose Extract, Green Tea Leaf Extract. 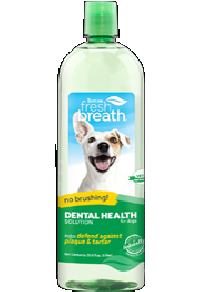 More from TropiClean to keep your pet smelling fresh! QuestionIt advertises probiotic but there isn’t anything listed in the ingredients. Is there actually some in the product and where would I found out which bacteria’s and how much? 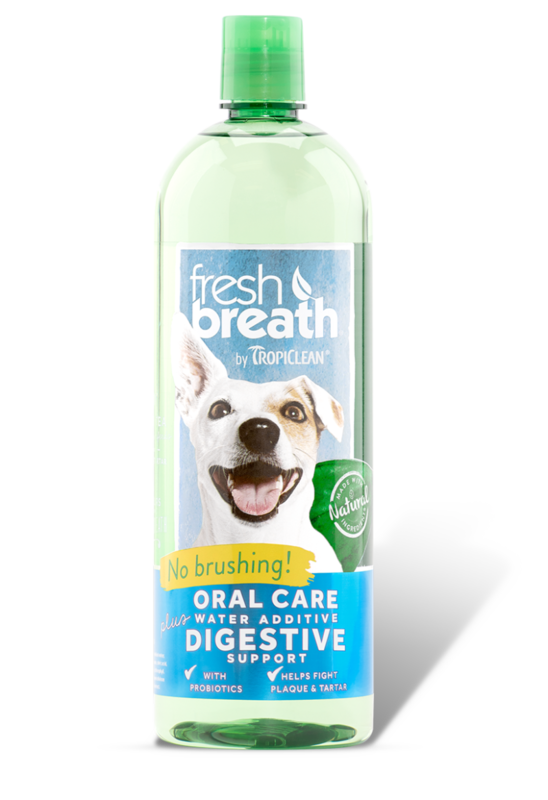 I got this for my pups but upon review and worries there isn’t really probiotics in the product as advertised. Hello and thank you for your inquiry. While it is not listed on the bottle itself, the listing of ingredients is on the website and the probiotics are fully listed on the sheath surrounding the bottle. Here is a listing of the ingredients for your convenience. canola oil, pollock oil, coconut oil, salmon oil, mixed tocopherols (preservative), rosemary extract, natural vanilla flavor, flaxseed oil, fructooligosaccharide, hemicellulose extract, yeast extract, dried enterococcus faecium fermentation product, dried lactobacillus casei fermentation product, dried lactobacillus acidophilus fermentation product. Please feel free to contact us at customerservice@tropiclean.com or at 1-800-542-7387 with any questions. This is an excellent productThis is an excellent product and the only one which works for my 9 year old Doberman. Shake well. Simply add one tablespoonful (one cap full) to your pet’s water bowl (approximately 16oz) every time you refill it.